Electric Vehicles (EVs) have been a hot topic in Hawaii in recent months. There was an EV Life blog in the newspaper and feature articles in a local magazine and on a local television station. There have been discussions about the drive, the car’s styling, driving range, car prices, state rebates, federal tax credits, electricity rates, charging stations, and more. But the one thing I didn’t consider, until I read an article in the Hawaii Reporter, is the effect of EVs on gas taxes. With more EVs on the road and (ideally) fewer gas vehicles, there will be less gas pumped – and less gas taxes collected. How will lower gas tax collections affect the budget for road repairs and maintenance? In an article titled “Vehicle-Mile Pricing: an Idea Whose Time Has Come, but How?” Randal O’Toole, a public policy analyst and Cato Institute Senior Fellow, has an answer: vehicle-mile pricing. He suggests eliminating gas taxes and replacing it with vehicle-mile fees, on a state-by-state basis. O’Toole cites an Oregon test system, which has people pay fees when they pay for gas, based on data from a GPS unit on their car. EVs could pay fees when they go to a recharging station. * Hawaii leads the nation in electric vehicles, with 422 EVs sold in 2011, or 1.2% of all car purchases; compared to the national level of 17,345 EVs or 0.1% of all car purchases (Sustainable Business. 6/16/12). * Hawaii leads the nation in electric vehicle charging stations, with one charging station for every 5,500 residents (Pacific Business News, 3/29/12). Pro: All drivers pay fees for actual miles driven (instead of gas taxes). Con: None that I can think of. Con: It could reduce the maintenance of rural roads. It infringes on privacy (even if no data is sent, GPS systems can be hacked). It’s hard to implement, hard to calculate, and hard to audit. Pro: Vehicle mile fees can reduce vehicle miles traveled, reduce congestion, encourage public transportation, and reduce urban sprawl. Con: It could raise the costs of public transportation. It could reduce urban sprawl (it is both a pro and con, depending on how you feel about cities and suburbs). Pro: EVs and fuel-efficient cars pay the same fees. Con: It could reduce the incentive to design, manufacture, and buy fuel-efficient vehicles. Pro: Fees are transparent (not hidden in the price at the pump). Con: Fees are harder to calculate fees or spot an error, especially if different roads have different fees. Of course, the whole vehicle-mile fee idea depends on 1) repealing federal and state gas taxes, and 2) implementing the technology to accurately and securely track vehicle miles (and possibly roads), transmit the data, and calculate the vehicle-mile fee. Government is always eager to add new taxes, but unwilling to repeal taxes. Do you think vehicle-mile pricing is a good idea? What other considerations are there? How can we pay for our roads and highways? Earlier this month, on a beautiful Sunday morning, my son and I went on the Hui ‘Ilio Dog Walk. The dogs were well-behaved, greeting each other politely, with only a few growls. They were eager to meet other dogs. People greeted each other with smiles; our dogs gave us a reason to talk with each other. The dog walk was a friendly affair. It started casually, no one jostling for position, everyone walking at their own pace. There was no pressure to finish first. Everyone had fun. We were there for our dogs and to support the dog park. * About health: Go for short walks. Enjoy your food. Drink lots of water. Get * lots of rest. * About living: Stick your head out the window. Get outdoors. Smell the plumeria. * About relationships: Be loyal to your family. Be happy when you see friends. Share your toys. * About education: With discipline and treats, everyone can learn. * About money: Friendly smiles and tail-wags are free. * About politics: Everyone is potentially a friend. * About personal responsibility: Clean up your own mess. If you have a dog, what have you learned from your dog? What can pets teach us? When I browsed through the proposed bills in the 2012 Hawaii legislative session, I was amazed by the number of tax credits being debated. Tax credits reduce the amount of tax you owe (unlike a tax deduction, which reduces the amount of taxable income). Businesses wanted tax credits for everything from business relocation and high technology, biofuel production and ethanol facilities, hotel construction and medical research, to hiring and telecommuting. Individuals were less greedy (or had fewer lobbyists), but still wanted tax credits for things like college savings, electric vehicles, and parenting classes. The intent is good (maybe): tax credits can help promote fledgling industries, encourage “good” behavior, and support “good” business practices. But in reality, they are also hand-outs to “favored” groups, often help only the wealthy (those who make enough earned income to take the tax credit), and make the tax code unnecessarily complicated. 1. No tax credits for personal choices, like parenting classes and college savings. Government should not influence or reward the personal choices we make. 2. No tax credits for buying things, like historic homes, energy efficient appliances, electric vehicles, and solar panel systems. Government should not influence our buying decisions, reward us for spending money, or require us to buy anything just to live. 3. No tax credits for private business activities, like hotel construction, small business investment, and new construction and renovation. Government should not reward “favored” businesses. 4. No tax credits for private business practices, like hiring, telecommuting, corporate mentoring, and wellness programs. Government should not influence or reward business decisions that would not be considered without the tax credit – unless the business practices are required by the government. 1. A flat income tax rate. We need one tax rate for all levels of income, with a reasonable deduction for dependents, the elderly, and the blind and disabled. A progressive tax, where the more you earn, the more you pay, may sound fair; but that depends on your definition of “fair.” Plus, a progressive tax is hard to figure out and makes it easy to justify tax credits. 2. A minimum tax for low-income families. Everyone should pay a small amount for state services, because we all benefit from public projects. This could be in the form of a residency fee. 3. A 3-year, reduced tax rate. To encourage new businesses and companies that engage in research and development, we could offer a limited-time lower income tax rate. 4. Tax-free health, education, and retirement plans. To encourage personal responsibility, we should allow health, education, and retirement savings plans to grow tax-free. Withdrawals for approved expenses should also be tax-free. What do you think about tax credits? Have tax credits made you buy something that you would not have bought otherwise? Would taking away tax credits change how you spend your money? My son just finished Kindergarten at a Honolulu public school. I put away his report cards, the parent newsletters, the lunch menus, and the PTO fliers. 1. Create studying routines. Kids like to know what to expect. On the way home from school, I reminded him of the things we needed to do: write one or two sentences in his school planner; finish his homework (if he has any) or pages in a workbook; do a coloring page or craft project (for birthdays or thank-yous); and two or three online practice math tests. I also let him make some decisions, such as what task he wants to do first, and what rewards he wanted for finishing his work. 2. Praise hard work. I praised him for his hard work, for finishing the task, and for not giving up – not just for being “smart.” I stressed that it’s okay to make mistakes and reminded him that we can’t quit. 3. Use humor to deal with frustration. When kids get frustrated, I’ve found that humor can really help. Sometimes I made silly noises when he got the right answer – or the wrong answer. Sometimes I raced him to see if he could answer the math word problem before I could read it. If he finished a worksheet that was difficult, I sometimes filled the page with stars or happy faces. If humor didn’t work, a short break (playing with toys or eating a snack) gave both of us a chance to calm down and try again. 4. 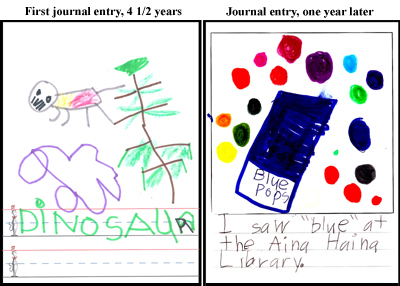 Start a field trip journal. To encourage him to remember events and write in sentences, we started a field trip journal using story-writing paper (a blank space at the top and lines at the bottom). After every special event – a birthday, a museum visit, a festival, a kids workshop – he drew a picture and wrote a sentence or two describing what he did that day. I helped with prompts and spelling, but I tried to let him choose what he wanted to write. How do you motivate kids to study hard? What are your best tips to build good study habits? Her story is compelling: she was an art therapist, and when her daughter Hannah was born, she filled the nursery with little clay plaques with inspiring messages – life lessons for her daughter and gentle reminders for herself, like “Believe in yourself” and “Let your dreams take flight.” Her four sisters loved the plaques, and asked to give them to their friends as gifts. Soon their friends wanted to buy more plaques to give away to their friends, and a basement art business was born that led to art fairs, gift shops, and a thriving business in a converted barn in Maryland. 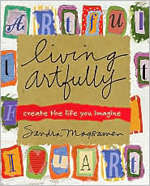 “Living Artfully: A Heart-full Guide of Ideas and Inspirations That Celebrate Life, Love, and Moments That Matter” (2006) by artist and author Sandra Magsamen inspires us, gives us tips to express our creativity, and reminds us to play. Her writing is relentlessly cheerful, positive, optimistic, and encouraging. She is definitely writing for a female audience in America, with cultural assumption about shared experiences and traditions. “To live artfully is to live life fully, with meaning and a purpose – to bring beauty into being” (page 4), Magsamen says passionately. The book is divided into seven chapters full of personal stories, colorful graphics, handwritten notes, and artful ideas, starting with each of us, and spreading outward in a widening circle of family, friends, neighbors, and community. 1. Messages from the heart: making connections. Art expresses who we are, adds meaning to our lives, and gives us an opportunity to play. 2. Imagine the possibilities: rediscovering your creative power. Give yourself permission to be you, think of yourself as creative, be innovative, play, use your imagination, and make friends. 3. Everyday art: creating moments that matter. “It is the little things in life that make living so grand” (page 70), Magsamen reminds us. Take time to write special notes, create brag books, congratulate others, and just have fun. 4. Home is where the heart is: making your home a reflection of you. Surround yourself with the things you value and love and that comfort you. Everyone needs a room or space for quiet and rest. 5. Celebrate life: artful ways for special days. The best gifts are “the people and experiences in our lives” (page 134). Create new reasons to celebrate! 6. Happy holidays: new ways for the big days. Simplify celebrations, share the cooking, decorate together, create gifts with meaning, and focus on spending time with the people you love. 7. You make the world a better place: making your mark on the world. Kindness is contagious; and simple acts of kindness require little effort. Just reading the first chapter inspired me: instead of buying holiday decorations last year, I made my own cardboard cut-outs of Santa, a reindeer, a gingerbread man, and a surfing menehune (elf) using pens, paints, and a utility knife. This spring I even signed up for a ceramics class at a community park. And I enjoyed it! Find out more about Living Artfully on her website, www.sandramagsamen.com. You are currently browsing the Better Hawaii weblog archives for June 2012.